Name of quilt pattern in background. Judy Garland movie Summer Stock. This quilt is hanging on a wall in the barn where Judy's dressing room is. While Gene Kelly is talking to her and rubbing her feet about the show's premiere performance. The quilt is skewed naturally and I can straighten it out in my photo program but haven't been able to save it straightened out! I became interested in this quilt because while the design may not appear to be anything special, the more I looked at it the more I could see other shapes emerging from the negative spaces of the pattern. Of course it is not one that can be drawn easily on a grid with square as much of the pattern has diamond shapes in it, one square and 4 pentagons, resulting in curves where there aren't any. 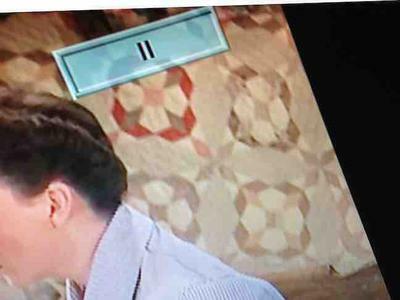 Have looked all over the web to the best of my ability and it seems no one has noticed this quilt in this movie. There is the quilt in her bedroom that has been identified a few times, but not the one in the barn. Only a quilter would notice an obscure quilt hanging in the background.